Executive Chef Tylun Pang has successfully brought the traditional Plantation Cooking of Hawaii to his customers. Those of you who have traveled to Hawaii for a while might remember when your dining out was frequently limited to a steak and lobster house, but you knew there was really good local chow being served in home kitchens and hole-in-the-wall restaurants. Times have changed as a wave of foodies and innovative chefs have discovered ways to make a good living serving trendy, fancy cuisine to island visitors. That said, it has still been hard to find da kine food that represented the cultures making up Hawaii. 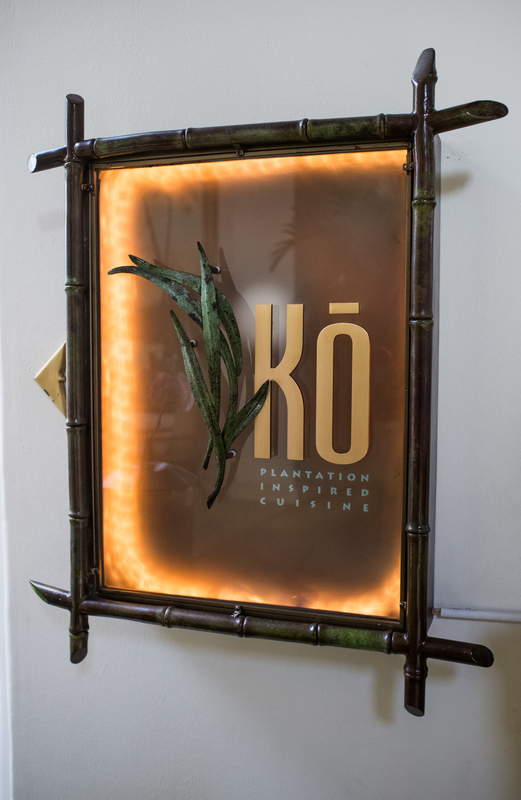 On the island of Maui, Chef Tylun Pang and his talented coterie of multi-cultural chefs have created Kō, a place we came to call a “teaching restaurant,” where you can dine the way Mauians have for generations. It is a place where treasured family recipes have been adapted to principles of elegant cuisine and presented with service respectful of the histories and cultural influences of the food. Kō Restaurant entrance at the Fairmont Kea Lani, Maui. It has been a long time since the first sugar mill started operation on Maui in 1828. Lewis and Clark’s historic cross-country trip across North America was still being evaluated and America was still forming, with a Civil War yet to come. Yet there on Maui, immigrant workers were arriving from China, Japan, Korea, the Philippines, Portugal and other nations to provide labor for the expanding sugar operation. Workers lived in camps on the sugar cane plantations and most raised a few vegetables and prepared family meals in the style of their homelands. From these very ethnic beginnings, combined at times with Native Hawaiian cooking, a unique “plantation-style” food style was derived. Hardy, nourishing food was required to restore the body from the arduous work in the cane fields and the sugar mills. The homemakers saw to it to provide sustenance in their home kitchens. Chef Tylun Pang grew up on Oahu in a family that loved food and, in Chinese tradition, every meal was a family event, with cooking done by his father and grandmothers. He says he can “close my eyes and still see Dad in the kitchen.” His father took him shopping for food in Chinatown and inspired young Tylun with his amazing wok skills. “The wok is still the first pan I reach for,” says Pang. Beginning his formal cooking career, Chef Pang started at the Ilikai Hotel in Honolulu, then, with generous mentoring from some European chefs, he went on to the Bonaventure Hotel in Los Angeles before returning to Hawaii, the place he really feels at home. With this experience and resume, Chef Pang eventually became Executive Chef at the Fairmont Kea Lani in Wailea, Maui and here is where the evolution of Kō started. Heading a kitchen staff in the hotel’s then-upscale Italian restaurant, “I looked around and realized we didn’t have one Italian in the kitchen,” he says. This was also the moment when the Kea Lani wanted to make a change and the collaborations that ensued percolated the idea of a restaurant representing Maui by its traditional multicultural home cooking. 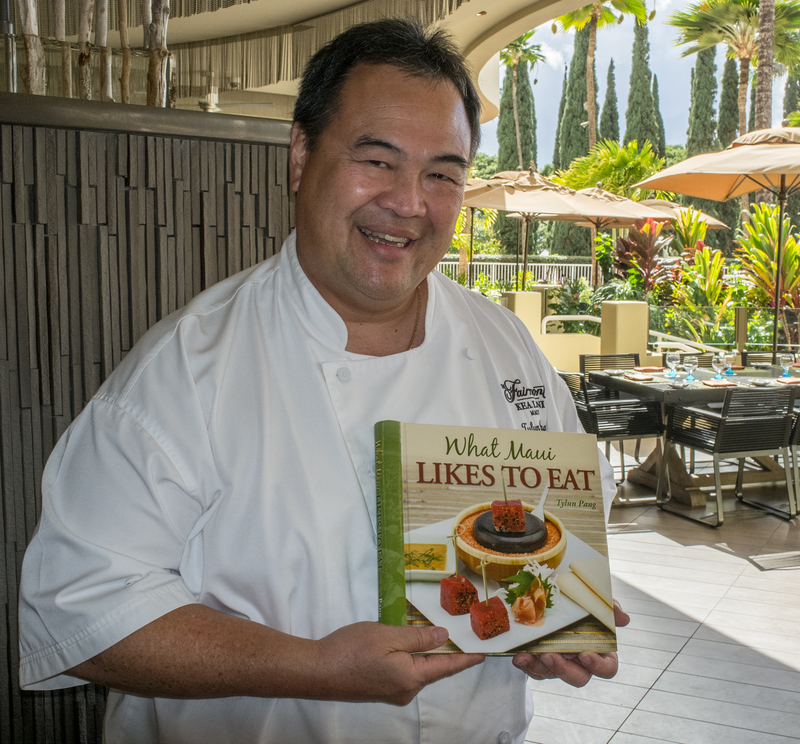 Chef Pang, with his culinarian colleagues, including Chefs Richard Ramirez and Richard Hoang, started collecting recipes from Maui families and other contributing chefs. Pang’s team made multiple visits to the exhibits at the Maui Sugar Museum in Puunene which depict the cultures that helped build the sugar industry. Distilling and adapting the recipes into the new Kō menu turned into a labor of love as Chef Pang and his colleagues realized they had found, to a great extent, the down-to earth, honest cuisine of Maui. Some items that made the Kō menu include starters such as Spicy Tuna Poke Bowl, Oishi Sushi, Lumpia Filipino Spring Rolls and Maui Cattle Company Kobe Beef Poke and Banana Ketchup BBQ Pork Skewers (an island street food favorite). Soups and salads range from Portuguese Bean Soup to Chop Chop Sesame Chicken Salad (with Won Bok Cabbage and Won Ton Chips). Among the adapted Plantation traditional items are Sugar Cane Skewered Prawns and Scallops, Zarzuela (a kettle of lobster, shrimp, scallops, mussels, clams and chorizo in a saffron broth – wow!) and Maui Cattle Company Korean BBQ Strip Loin (with tempura shrimp and house made Kim Chee). There is also the delicious Lavender Honey Macadamia Nut Shrimp and Painiolo Bone-In Rib-Eye Steak. Fresh fish, from local Hawaiian-waters, weather permitting, are offered with a range of preparations that include: Ginger Steamed, Macadamia Nut Crust, Kea Lani Garden Herb and Wok Seared. We tried Monchong (a deep sea Pomfret) and local Lehi, served with a delicious side of purple, Molokai mashed sweet potatoes. So where do all these ingredients come from? Chef Pang has long been committed to local sourcing (remember, his Dad took him shopping in Honolulu’s Chinatown as a small boy). He knows most of the small farmers on Maui and many of the fishermen people like Chauncy and Teena Monden who run Kula Country Farms on the slopes of Haleakala and produce amazingly sweet Kula Onions and delicious Kula Strawberries. 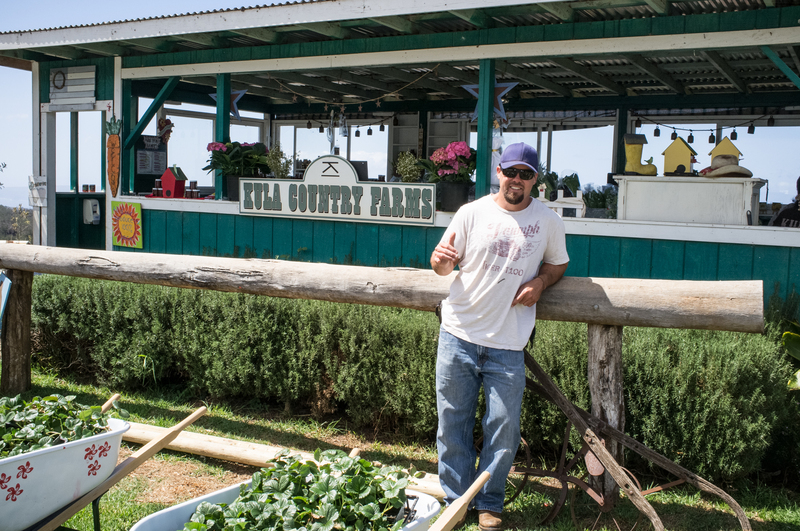 Chauncy Monden, 4th Generation Maui Farmer, Kula Country Farms. Chef Pang knows when Hana fishermen are catching Ahi Tuna, for example, and regularly talks by phone with chefs across the islands to find out how their fish and produce sources are managing. 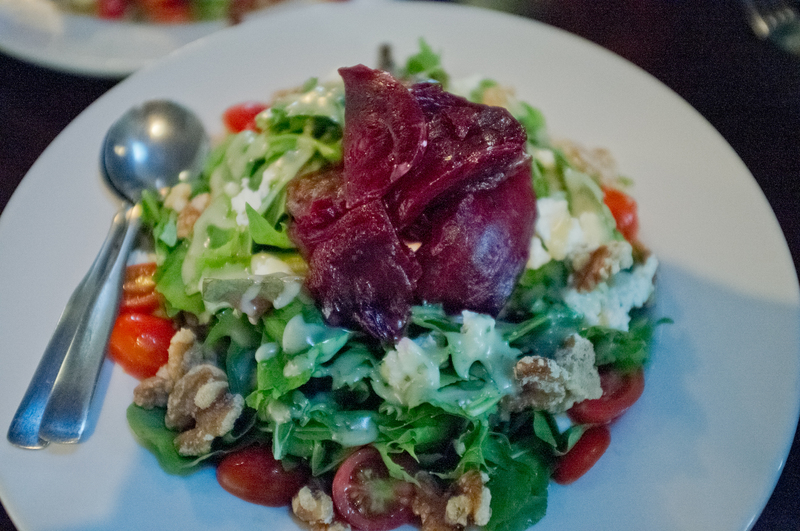 Colleen’s Beet Salad with fresh organic Kula greens, organic grape tomatoes, candied walnuts and goat cheese. A trip to Maui these days is not only a trip to an astonishingly beautiful place, but it can be a great opportunity to learn more about Hawaiian history and the modern Mauians’ embrace of sustainable agriculture coupled with fine dining, plantation-style. Trip planners and resort concierges are available to help you plan farm tours and other excursions that will put you right on the farm-to-table route. This entry was posted in Dining, Travel Destinations and tagged Colleen's the Cannery, cuisine, Farm to Table, hawaii, Hawaiian Cuisine, Kula Country Farms, maui, Pacific Ocean, Plantation Cuisine by Frank DiMarco. Bookmark the permalink.